Monday morning at the festival. Image: David Payne / ANMM. 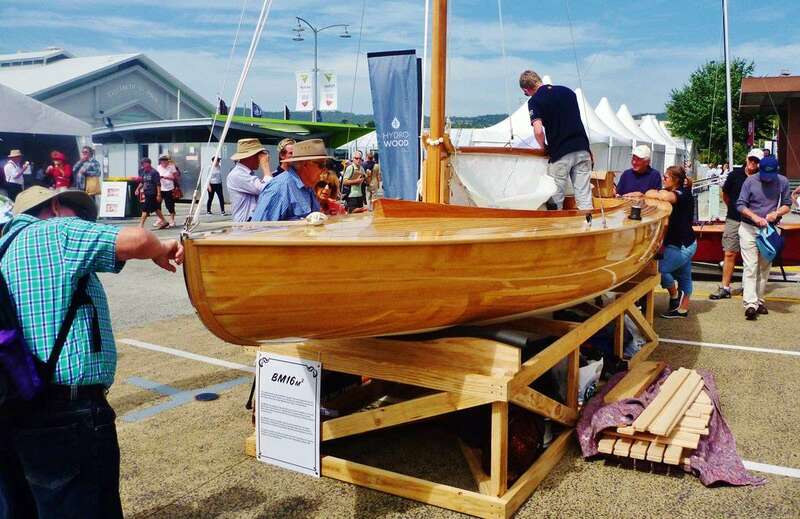 Over 500 boats, numerous displays, demonstrations and talks, four seasons of weather plus a rainbow, and not to mention the fine Tasmanian food, it’s always a challenge at the Australian Wooden Boat Festival (AWBF) to cover everything with not much more than three days to see it all. The museum managed to do it by sending a diverse contingent of staff for the festival, which ran from Friday 10th through to Monday 13th February, 2017. Some of us couldn’t wait for the festival to start and therefore, arrived earlier for the Australian Maritime Museums Council (AMMC) workshop. Peter Rout and Sharron Babbagewere there to take part and had been working hard with Maritime Museum of Tasmania and AMMC executive to set up the workshop. Additionally, Australian Register of Historic Vessels (ARHV) staff Peter Higgs and myself were on-board, presenting about the register and Peter’s research work. Em Blamey facilitated a highly successful 3-hour workshop on panel exhibitions with input from curator Nigel Erskine and conservator Rebecca Dallwitz, and this was preceded by Emily Jateff who talked us through the how’s and why’s of a successful exhibition. Former staff member Jeff Mellefont was there, and when Jeff left the museum Janine Flew took over his responsibilities for publications, she too was also in Hobart for the AMMC workshop and festival. Prior to the Thursday night dinner, the ARHV handed out pennants to five more Tasmanian craft listed recently on the ARHV over cocktails at MMT. 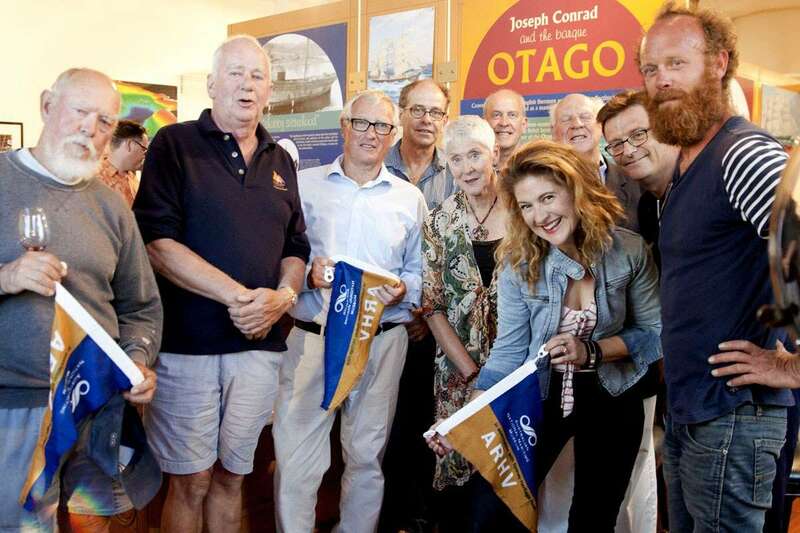 Vessel owners with their pennants at the ARHV presentation with David and Kevin. Image: Sharon Babbage / ANMM. While the workshop was coming to a close on Friday morning, Matt Lee and Kim Turski set up the museum’s booth on Princes Wharf for the AWBF, where Store items, information, volunteers and staff were available all weekend promoting the museum, the ARHV, the Voyage Game and anything the public asked about. The symposium was a key element of the museum’s collaboration with the AWBF this year, and the museum sponsored the programme of 2 ½ days of talks and presentations. Nigel, Indigenous curator Donna Carstens and myself gave presentations on the search for the Endeavour, Indigenous watercraft and the ARHV website respectively, and Jeff Mellefont gave a presentation about Indonesian vessels he has researched, a project he continues as an Honorary Researcher for the museum. Circulating, fact finding, networking and meeting people were key members of the museum’s sponsorship, foundation and project management areas, Gail de Raadt, Andrew Markwell and Annabelle Berriman. The director Kevin Sumption and chairman Peter Dexter along with Shirani Athahas were also there for much of the weekend and proud hosts for the museum’s cocktail night in the Brooke St Pier. 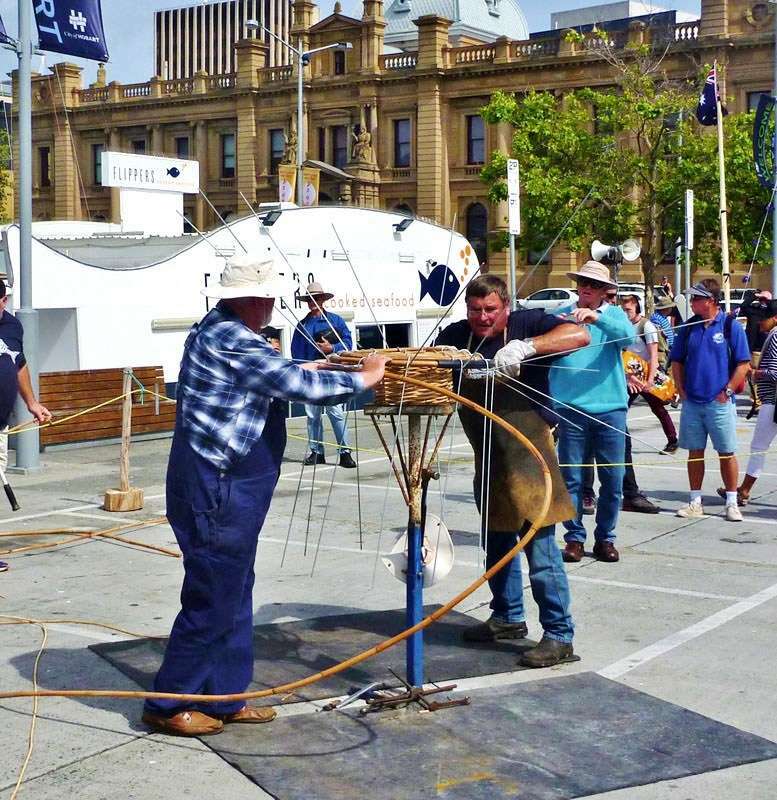 Built around the foundation of wooden craft from Tasmania and elsewhere, the AWBF branches into various avenues of related activities and displays. 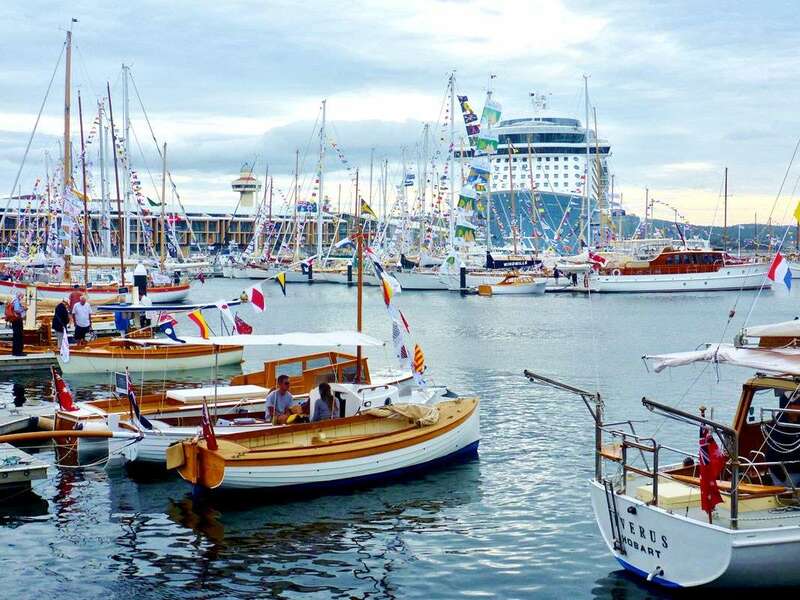 The Dutch presence was the international flavour for this years festival: They had numerous small craft, an exhibition, a traditional yacht they had built in Franklin (later sold at auction) and another sloop that match raced a Tasmanian yacht on Sunday. The symposium featured a number of North American speakers including renowned photographer Ben Mendlowitz and representatives from Off Center Harbour, while Ron Holland, an ex-New Zealand then Ireland based NA came to talk about using wood in modern designs. The trade stalls shared their space with tents for the enthusiast groups, there were models, boat building demos, entertainment and plenty of good weather until a wintry change came through on Sunday. The Dutch 6m2 class yacht built in Franklin by a Dutch team and auctioned onsite on the Sunday. Image: David Payne / ANMM. Lobster pot construction being demonstrated. Image: David Payne / ANMM. A very special feature was an Aboriginal ningher canoe made by Sheldon Thomas over a 3 month period, it was paddled into the dock area and played a major part in the opening ceremony. In the background (it’s not wooden but it was there for 36 hours) was that giant cruise ship Ovation of the Seas. 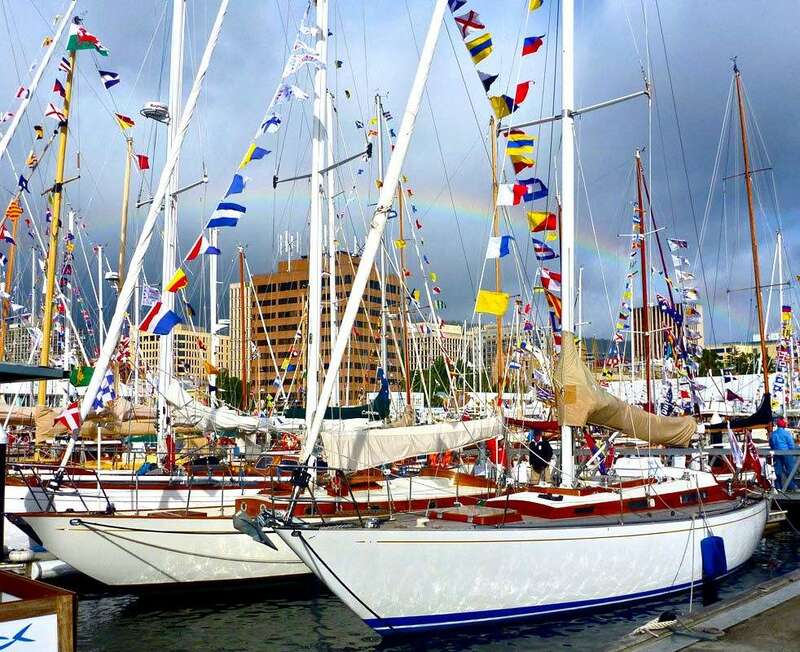 It had docked for a second time in Hobart, and was cleverly moored so that when all 5,000 passengers came ashore, they went through the festival site and became part of the impressive number of people coming to this outstanding festival every two years. 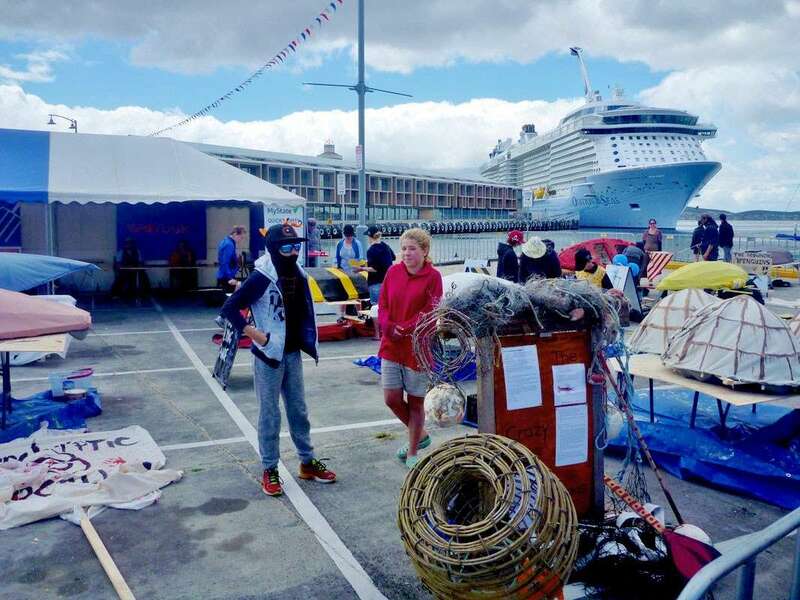 School kids and their creations at the Quick’n’Dirty competition, with Ovation of the Seas in the background. Image: David Payne / ANMM. The museum looks forward to playing a part next time in 2019, in this premier wooden boat event. Being there also allowed us to promote our own show of heritage craft as well as the Classic and Wooden Boat Festival coming up in Sydney, April 2018. Saturday featured the biggest to the smallest on display. Image: David Payne / ANMM. —David Payne, Curator of Historic Vessels. Explore the new website for the Australian Register of Historic Vessels.